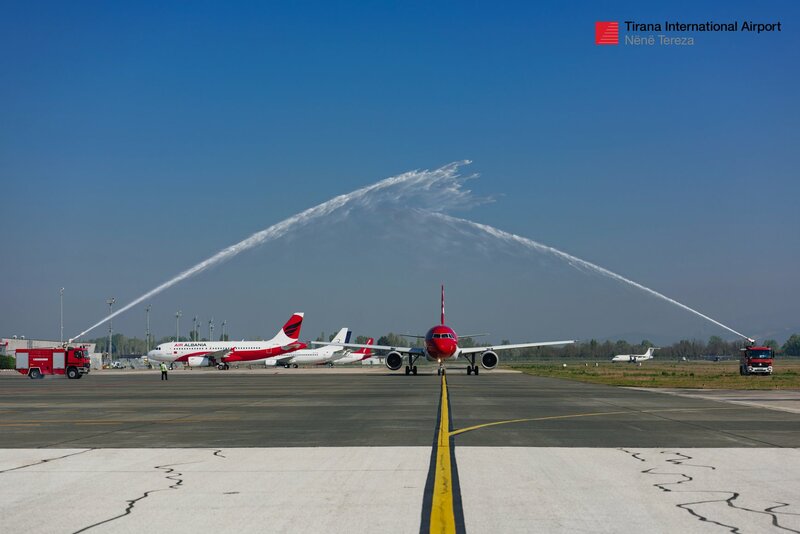 The first Edelweiss flight that will connect Tirana and Zurich was welcomed by the traditional water salute on Monday. Albanians living in Switzerland, Swiss tourists and investors will have the opportunity to reach Tirana from Zurich in less than two hours. The Swiss leisure will fly from Zurich to Tirana and vice-versa twice a week, respectively every Monday and Friday. The Swiss company operates scheduled flights to 70 destinations in 34 countries. Ambassador of Switzerland in Albania Adrian Maitre expressed his appreciation for the collaboration with Tirana International Airport and for the fact that TIA is expanding its services. On his part, TIA’s CEO Rolf Castro-Vasquez said that other destinations will be coming soon. Tirana International Airport announced the flights’ timetable while saying that the new route will offer direct access to Switzerland’s largest city, with a population of 380,000 and over a million people living in the region. Home to the headquarters of many Swiss firms, financial services companies, life sciences research centers and businesses in the creative industry, the city is one of Switzerland’s most important economic hubs.